We all know that brushing helps to keep your teeth white and healthy, but it comes with many other surprising benefits as well. #1. It helps to protect your lungs. The environment in your mouth is perfect for bacteria growth, especially when you eat sugars and starches that encourage bacteria to multiply. The same bacteria that causes plaque to form has also been linked with an increased risk of severe respiratory infections, like pneumonia. Many researchers believe that this is a result of the bacteria in the mouth being inhaled into the respiratory tract, leading to an increased risk of infection. #2. It keeps you healthier while trying to conceive. Trying to have a baby? If so, don’t forget to brush your teeth! The chemicals in your mouth that cause plaque and gum disease can enter the bloodstream, adding stress to your body and can delay conception. One study found that women who suffer from gum disease take an average of seven months to conceive, while women who regularly brush and floss take an average of five months to conceive. #3. It keeps your heart healthy. Chronic oral infections, like gum disease and cavities, has been directly correlated with inflammation of the cardiovascular system. This means an increased risk of stroke for men and also younger individuals. Controlling bacteria levels with thorough brushing, flossing and regular visits to your dentist is part of keeping your heart healthy! 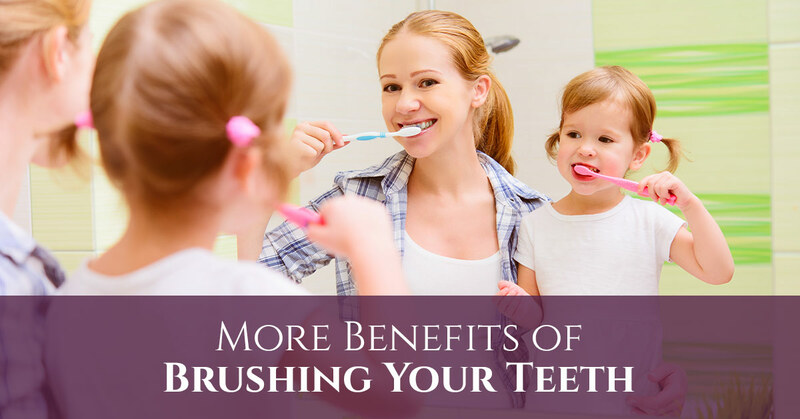 These are just a few of the many surprising benefits that come with brushing your teeth on a regular basis. If you haven’t picked a New Year’s resolution yet and you don’t already brush your teeth as you should, why not resolve to take better care of your mouth and brush your teeth more regularly? Not only will your teeth be healthier and whiter, you’ll also enjoy the many additional benefits of brushing your teeth! If you have any questions or concerns about your oral health or brushing your teeth, or if you would like to start 2017 off right with a dental exam, please contact us today!